When Christmastime rolls around each year and sweets seem to pop out of every tiny crevice, I have a really difficult time passing over anything minty. It’s a weakness. So much so that I put peppermint in my hot cocoa and sometimes even my coffee. I hunt down peppermint ice cream at the grocery store. I eat candy canes from the Christmas tree. (Who actually does that??) And when my turn came around again for Project Pastry Queen and I flipped passed the Grasshopper Pie recipe, I immediately closed the book and emailed Shawnda my choice. Maybe my bordering-on-obsessive love for peppermint comes from my past. When I was a kid, I thought that Grasshoppers were just part of having Christmas dessert. Later I came to find out that this minty alcoholic drink was actually being consumed by my family because of their overconsumption. It seems ridiculous to try to fit more of anything in your body when you were already passed the tipping point but Grasshoppers are known to take the edge off…to make a little room for, you know, more food. I don’t really remember drinking these until I was an adult (though my brother started begging for them when he was 9 or 10) but to me, there is not a more quintessential drink for Christmastime than Grasshoppers. And this pie couldn’t have been more nostalgic for me. It brought back all those great memories of Christmases past at my grandma’s house with my family gathered around the dining room table playing Tripoley. Yes, we gambled on Christmas – pennies never hurt anyone. Invariably, there were one or two people sleeping off food and booze on various couches but they always awoke when it was time for Grasshoppers. Once in a while, a Grasshopper Pie would show up on the dessert table and this frozen treat always went over well. The Pastry Queen’s version is a throwback to the old days, though I think other versions I’ve eaten were made with a store-bought whipped topping rather than eggs and whipped cream. Nonetheless, both Kyle and I love this pie. It’s cold, creamy, and minty, though next time I’ll add a wee bit more crème de menthe both to boost the minty flavor and to add a little more green to the dessert. Since last week’s PPQ dessert involved an unbaked cookie crust that proved difficult to remove from the tart pan, I blind baked the crust this week and it made a huge difference in removing a slice from the pie plate. If you choose do to this, preheat the oven to 400 degrees F, bake crust for 1o minutes and allow it to completely cool before you add the mixture to the pie plate. I have to say that even before I made this pie, I offered to bring it for Christmas dessert at my parent’s house this year and I know it be just as loved as the Grasshoppers of yesteryear always were. I can’t wait to see how it goes over with everyone else! 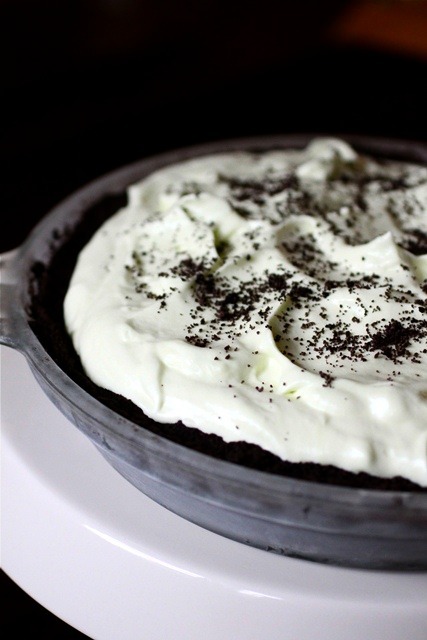 Be sure to check out how everyone else made out with the Grasshopper Pie over at Project Pastry Queen. To make the crust: Process the cookies in a food processor fitted with a metal blade until ground to coarse crumbs. Pour in the melted butter and pulse until the butter is thoroughly combined. Press the mixture evenly over the bottom and up the sides of a 9-inch pie plate. To make the filling: Using a mixer fitted with a paddle attachment, beat the yolks and the egg in a large bowl on high speed about 5 minutes, until thick. In a small bowl, combine the gelatin and creme de menthe; let soften for 5 minutes. In a medium saucepan, combine the water and sugar and simmer until the mixture reaches the soft ball stages, registering between 234 and 240 degrees F on a candy thermometer. In a slow, thin stream, add the sugar mixture to the egg mixture, mixing on low speed the entire time. Add the creme de menthe mixture and beat on medium-high speed about 5 minutes, until the mixture has thickened and cooled. Add the marshmallow creme and mint extract; continue beating on medium speed about 2 minutes. The mixture will be very gooey. In another large bowl, whip the cream on high speed, using a mixer fitted with a whisk attachment, until stiff peaks form. Fold the whipped cream into the marshmallow mixture and pile it into the prepared crust. (There will be enough filling to mound it higher than the edges of the pie plate, which gives it a great look.) Cover the pie and freeze at least 6 hours or overnight. The pie will keep in the freezer, well wrapped, for 2-3 weeks. Serve it frozen. Slice it and cover the slices with warmed hot fudge sauce. To make grasshopper parfaits, layer stemmed glasses or sundae glasses with spoonfuls of ground-up cookie crumbs (omit the melted butter), hot fudge sauce, and filling. Each parfait should have at least two layers of each component. Top the parfaits with 1 tbsp cookie crumbs mixed with 1 tbsp crushed peppermint candies. Freeze for at least 3 hours and serve frozen, accompanied by a pitcher of warmed fudge sauce to be drizzled over the top. Makes about 8 parfaits. Heat the cream and brown sugar in a heavy saucepan over medium heat. When the sugar is dissolved, add the butter, chocolate chips, and bittersweet chocolate and stir over medium-low heat until the chocolate is melted and the mixture is smooth. Stir in the salt. Remove the fudge sauce from the heat and stir in the Jack Daniel’s. Keep warm until ready to slice and serve the pie, or cover and store in the refrigerator for up to 1 month. The sauce can be reheated in the microwave or in a saucepan on the stove top over low heat as often as necessary. Great choice, Tara! Awesome dessert!! 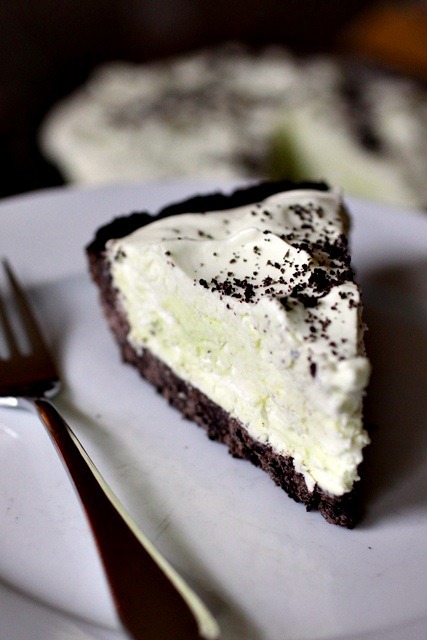 grasshopper pie brings back so many memories. Love it! Looks lovely! Can’t wait to make it this week!